Not sure if any one saw this listing on EBay the other week. Is it just me or does this cloth flash look like it has the canvas variation stiched to the back? Very strange and rare piece. 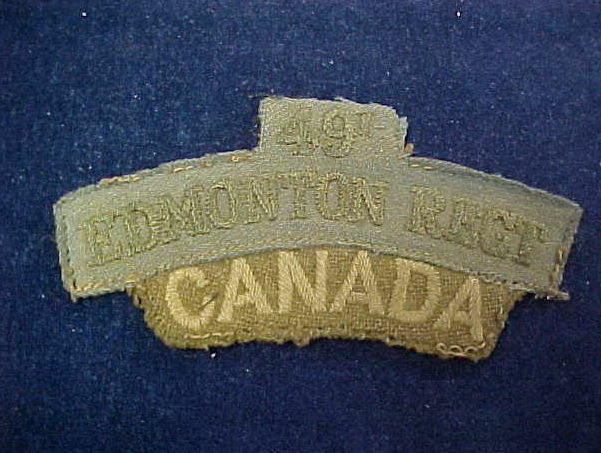 I'm not certain I understand your question but it's a standard Edmonton Regt flash with a Canada title stitched to it. It's a nice piece that has certainly seen service. Hi Ron, As Stephen indicated the shoulder title is one of the standard early issue titles. Insignia policy evolved over the war, but one of the key points was that the army wanted Canadian units clearly identified as Canadian. This initially manifested itself with the worsted CANADA title worn by 1 Canadian Division (later 1 Canadian Infantry Division) when they went overseas in 1939. When coloured cloth shoulder titles were authorized in the fall of 1940, it was set that the nationality must be either in the shoulder title (eg Royal Canadain Regiment) or indicated by the separate Canada nationality title. Three regiments of 1 Can Div had titles before the authorization, the PPCLI, No 1 Provost Coy (wore RCMP abbreviated title) and the Loyal Edmonton Regiment. As their title did not include Canada, it was stipulated that it be added. The interpretation at regimental level was that the nationality title was to be sewn to the L Edmn R title. Link will be dead soon so here is the pic. Bill wrote: Hi Ron, As Stephen indicated the shoulder title is one of the standard early issue titles. Insignia policy evolved over the war, but one of the key points was that the army wanted Canadian units clearly identified as Canadian. This initially manifested itself with the worsted CANADA title worn by 1 Canadian Division (later 1 Canadian Infantry Division) when they went overseas in 1939. When coloured cloth shoulder titles were authorized in the fall of 1940, it was set that the nationality must be either in the shoulder title (eg Royal Canadain Regiment) or indicated by the separate Canada nationality title. Three regiments of 1 Can Div had titles before the authorization, the PPCLI, No 1 Provost Coy (wore RCMP abbreviated title) and the Loyal Edmonton Regiment. As their title did not include Canada, it was stipulated that it be added. The interpretation at regimental level was that the nationality title was to be sewn to the L Edmn R title. Hi Bill, I understand every thing that you wrote, My WWII Canadian cloth collection focuses on 1st Div regiments. I have a couple of these Loyal Eddies in my collection with the Canada flash sewn on the bottom. I was not talking about the Canada addition to the flash. What i am refering to is I think there is a canvas variation of the Loyal Eddie hidding under/behind? Or is that some kind of backing I have not seen on the particular variation of this flash? Really looks like a canvas flash to me. Sorry for not making that clear in my first post. Also thanks for addin the picture for people to see the flash mk1rceme. Hi Ron, Sorry I misinterpreted what you were asking. I don't see a canvas title there. I have seen over-embroidery on canvas. I have a First Hussars that was embroidered and a dark blue melton backing was added to the canvas.